Extremely rare and visually stunning, petrified wood is natural beauty at its best! After being cut to size and hand polished, the dramatic contrasting colors are revealed. Large or small, we hand select every piece to insure that we get the most captivating specimens to create one of a kind custom petrified wood tables. Once brought home, these amazing pieces can’t help but become one of the main focal points of your home. Recognized for its exquisite color, petrified wood has very dramatic features and some of the most captivating grain ever. The complex beauty of the wood is a result of the chemistry of the area where the petrification process occurs. Delicate intricacies of individual regions will create totally different results. Under the right circumstances minerals like carbon, manganese, copper, and iron in the earth and groundwater combine with the natural grain patterns of the wood to create these rare 25 million year old fossils. The pieces we select and use for our finished petrified wood tables are some of the most breathtaking examples available. Once finished and delivered, your custom piece will become the focus of your home or office. We have small stumps that can be used as stools, side tables, or seating. And we also have large petrified wood slabs that are great for coffee tables, desks, dining or conference tables. A sensational piece of furniture millions of years in progress. Our petrified wood dining tables are cut from fossilized trees that were buried by layer upon layer of ash and mud for countless years. Each fossilized tree was hand selected for its exceptional texture and color. Every slice radiates shades of black, white, platinum and can have creamy browns, reds, and blues highlighting the natural grain. Every piece is a one-of-a-kind piece and is polished to a smooth mirror finish resulting in an undeniably spectacular surface. 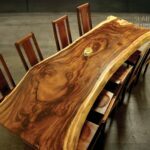 Our petrified wood dining tables are custom designed specifically for your space and style. You will be able to choose your piece and the table legs to make the dining table your unique statement of style. help transform each specimen into an very fashionable piece of furniture. We use amazing live edge cross cuts or vertical slabs combined with stainless steel, bronze, and raw steel to taylor our pieces to your style. The stainless steel bases can have a brushed or mirrored finish, while the raw steel lends its self to a darker gun metal finish. Our bronze bases are hand sculpted and then cast in a foundry making the bronze option a sculptural and very stylistically unique choice. Even a cluster of varying sized stumps can create an incredible petrified cocktail area. Each petrified wood table is a vastly durable work of art and while being perfect for day-to-day use, the modern organic look is smooth offering a solidity and feel of permanence equal to that of gems. A petrified wood side table from the David Alan Collection is a sophisticated, modern, yet organic accessory for your home. Slices or small slabs combined with stainless, steel, or bronze bases make unique compact pieces, perfect for your, bedside, couch or side table. Capture a feeling of relaxation and luxury with a meeting or conference table top made of petrified wood. Allow your conference area to be a flawless retreat designed with contemporary, sleek, and stylized interiors from the David Alan Collection. Be inspired and express tasteful splendor. Incorporate elements of wood, earth, and stone into your space. 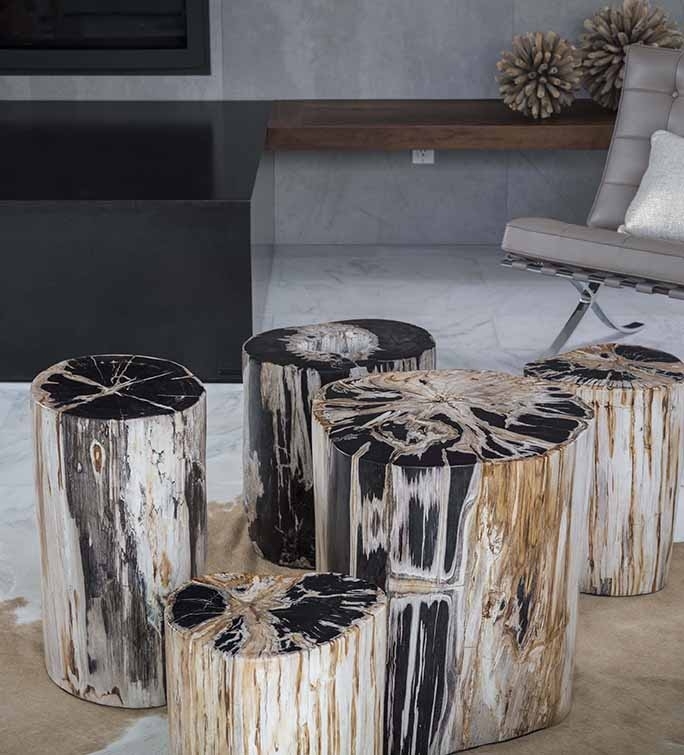 Petrified wood stumps add modern rustic beauty to your home or office. 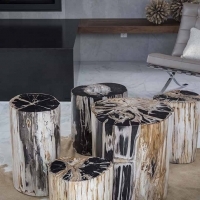 Used as a side table, stool, or seating at a larger table, petrified wood stools can standalone or function in combination with other furniture. Each stump celebrates its one-of-a-kind characteristics. 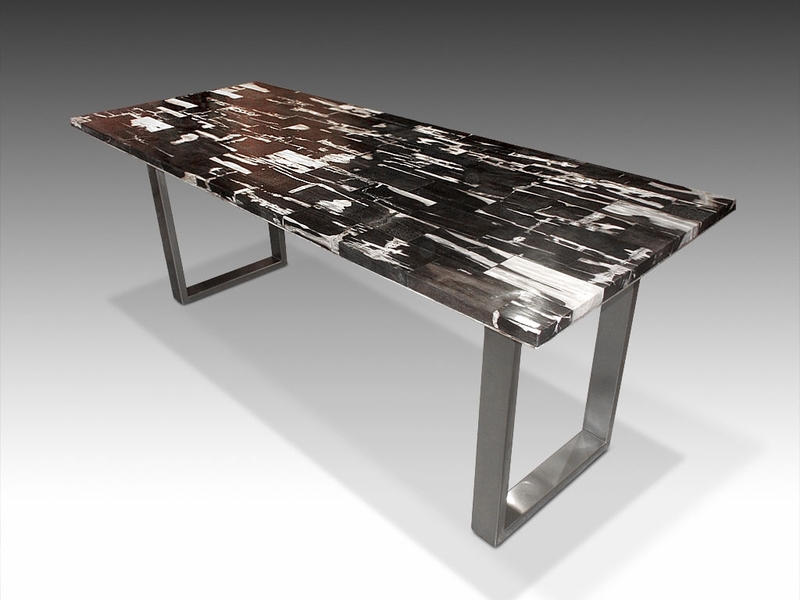 We boast one of the largest selections of petrified wood tables in California that is in stock. View our incredible collection in the Solana Beach gallery. Contact our team to begin creating your custom piece, see examples, discuss sizing, and to receive pictures and sizing of our current inventory. If the right piece isn’t currently available, we do the sourcing ourselves and we welcome commissions. Would you like more information on petrified wood tables? 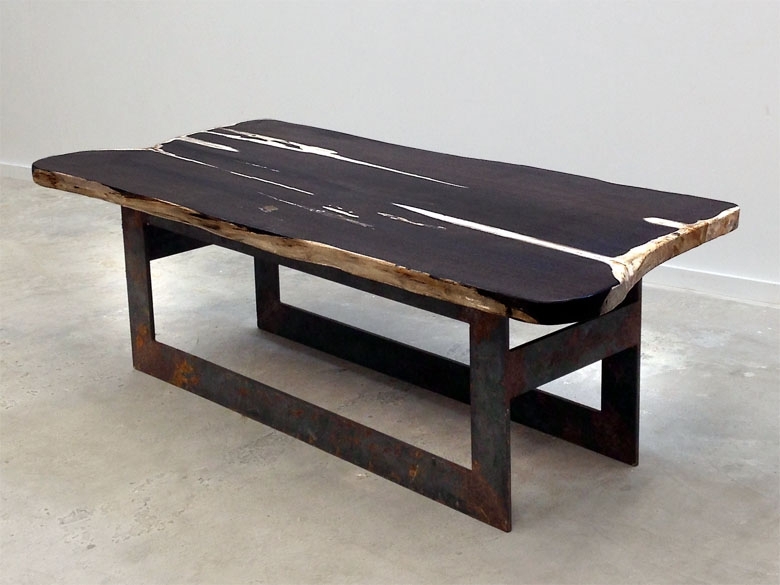 The custom petrified wood tables at the David Alan Collection are all one of a kind. 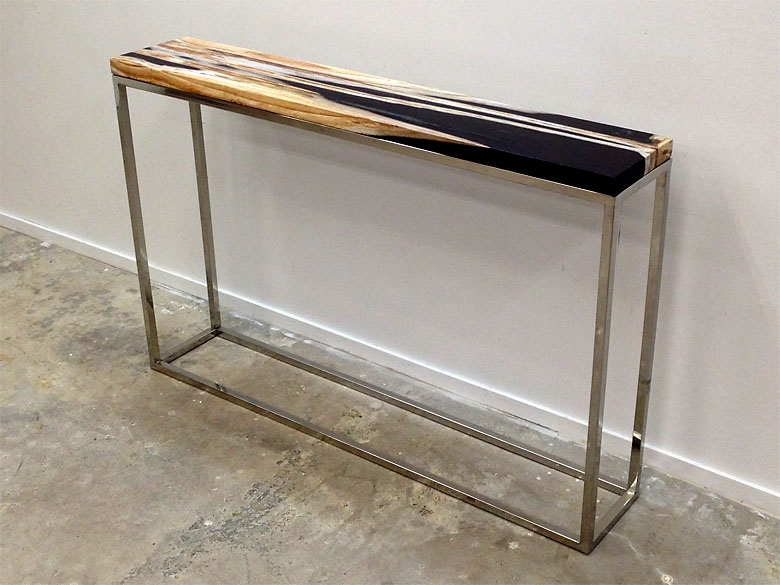 Each petrified wood dining table, coffee table or side table is a stunning accessory to any decor.